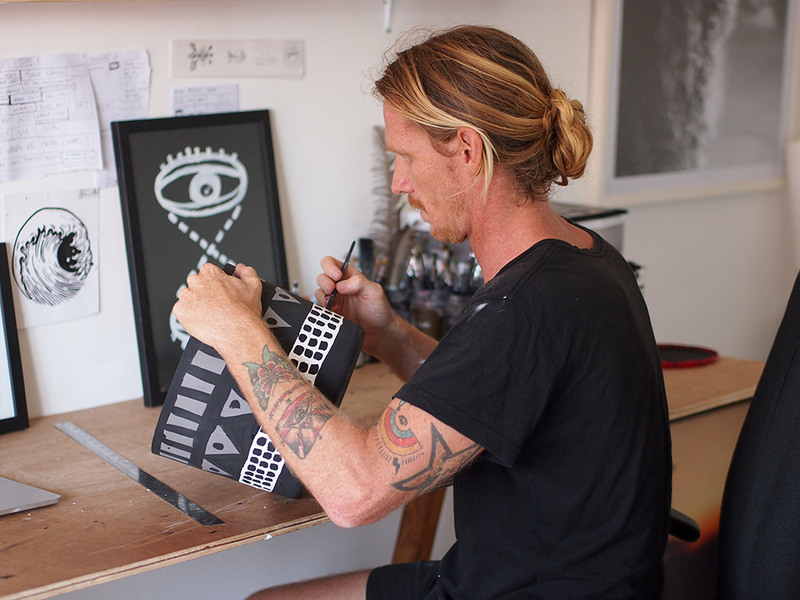 We interviewed Stuart Smythe about his background, his life living in Bali, his artwork and his recent collaboration with East Editions. We hope you enjoy the interview, and get more of an insight into Stuart's life, art and of course East Editions. SS: I believe creative people have an intuition to follow their path as an artist, I always felt someone was tapping me on the shoulder saying “hey you over there... lets do this thing with a pencil and paper.” It was very natural. I was always drawing through my younger years, I really enjoyed it. The path began as flow of lessons and self discovery in finding what satisfy me. Exploring visual and creative languages has allowed me to experiment with many different creative processes, art is a process. SS: I believe my artwork has become much more “etherical" over the years. I used to make art based on strict concepts or ideas, as a type of statement or a narrative. Now I like to make marks without too much thought, as a form of meditation, being more expressive and less contrived. SS: Lets be honest, I came to Bali to surf. From here, I found a freelance career which allowed me to stay. The city, the overpowering corporate spam, the hectic busy lifestyle was draining. To me, Bali felt like the opposite of that. It feels very easy. I enjoy the waves, the food, the people, the culture... it is a very unique part of the world, a cultural melting pot of everything thing I enjoy. EE: How much does environment set your pace? SS: My environment is a huge influence on me. Being around the ocean and coastlines is a consistent part of my whole life. The pace is slower around the sea, people are more relaxed, the horizon line is calming and the air energises me with healthy ions. I try to slow myself down to appreciate the smaller simple details of living. SS: My inspiration comes from everything. There is not one single source. The ocean, nature, traveling and people are my main stimulants. Inspiration flows like waves. If you are ready and open to catch it, you will. If you are not, it will pass right on by. There is something magical about living in the moment, I think this is reflected in my art. EE: Can you tell us a little bit about the art scene in Bali? SS: There are a few well established artists living in Bali who exhibit world wide. 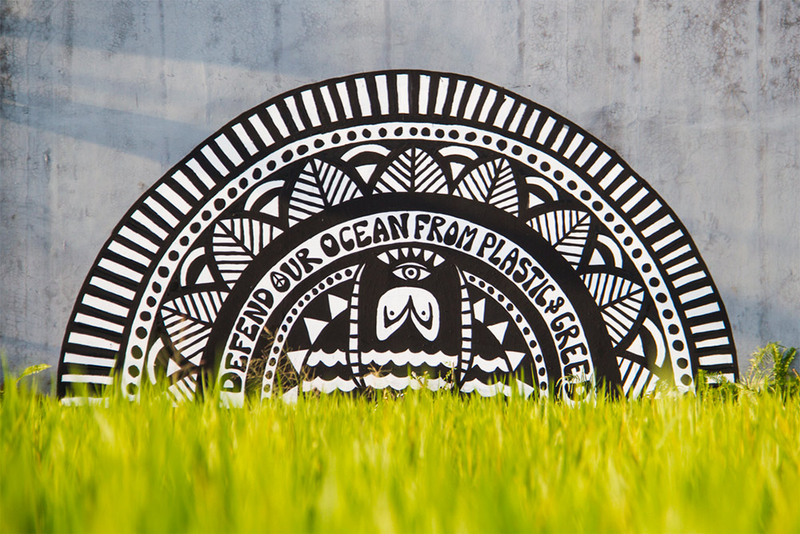 As well as a flourishing street art movement made up of locals, tourists and expats. There are a few boutique shops, galleries and groups that support the scene. EE: What was your creative process for the East Editions pots? SS: I felt very free when painting these planters. There was no plan, just black and white paint, some circular concrete pots and my brushes. It was really nice to start painting and let the previous marks influence the new ones. I treated the pots like 3 dimensional mandalas. And found an individual rhythm with each pot and size. A nice consistency started to develop after the 3rd or 4th piece and I began to work with and expand on that. EE: How would you describe your designs you created for the pots? SS: Etherical, intuitive, rhythmic, spontaneous, earthy, primal and raw. EE: Did you enjoy the process of painting on concrete pots as a medium instead of a wall or canvas? How long did it take? SS: Yeah it was a fun and exciting process, as I didn't really know how they would turn out. It is different because there is no frame, a circle is an infinite plane so I had to think about linkage and connections which happened quite naturally in the end. It is surprising how much surface area there is on a conical concrete pot that stands 80cm tall. They took around three full days. EE: This year you welcomed your first child into the world. What has been the most surprising thing about parenthood for you? SS: I welcomed my little boy Kona into the world. He is the most amazing gift. It has been an amazing experience. I think the most surprising thing is the feeling of unconditional love you have for your child, something you are told about but can’t fathom before they arrive. It's such a soul for-filling experience and it's only just beginning. SS: I have a few destinations booked as traveling is a big part of my life and inspiration. I will continue making art, taking photos, exploring the process and working towards a solo show or two next year. I'm feeling some fresh new visions coming up and cant wait to explore it and share it.